Only 17% believe health care costs will go down if Congress passes the health care legislation. 40% favor the health care plan - 55% oppose! 46% of voters somewhat approve - 52% disapprove! Tags: job approval, President Barack Obama, Rasmussen Reports To share or post to your site, click on "Post Link". Please mention / link to the ARRA News Service. Thanks! He's so proud of himself. He's achieving everything his handlers have told him to do and they are pleased. The great statists and socialist commie spirits are looking up from HELL at Obama with pride in their bloodshot eyes!!! 91% of blacks still support him. Sad for them that they are being used by the KKK Party. Without minorities, Obama would be in the 30s or less. Period. The only other people who I think have joined the minorities are the Hollywood nuts and I can't for the life of me figure out why some pretty smart people won't wise up and get their heads out of their asses. Couldn't happen to a better person. 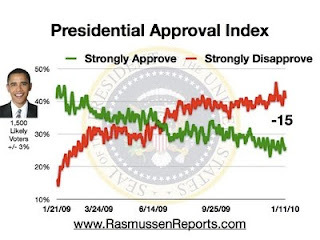 Only 11% more needed of the 33% in the middle range to wake up and form a 51% strongly disapprove and defeat him in 2012.... We need to bankrupt the koolaid makers.... I honestly still can't believe his approval isn't lower already. Something will happen. This country won't survive another three years of his reign of terror. And I understand that the Mass. race is a virtual dead heat now! Reign of terror is right..... Every day it is something else... every day another step is taken in the wrong direction - and not just wrong - scary and disconcerting!! I think what this represents are rats jumping off a sinking ship. I'd be willing to bet you'll start to see all manner of people, who supported O'Bimbo (I think he must be 1/2 Irish), criticizing him, identifying with Republicans (at least publicly) then, once again, trying to water down the Republican Party. 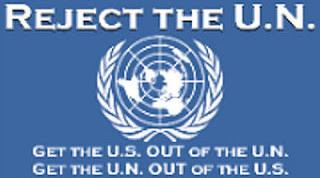 One thing the Obama administration has done is to show America how corrupt his friends and people he has appointed are. Why can't we fire them? I approve of the disapproval. How about real change we can believe in this year and 2012? Very happy to see people are starting to get their eyes open. Restores some of my faith in the intelligence of Americans that I lost after the 2008 elections. Yeah, there's always going to be the ignorant ones - I'm just glad they're getting fewer! No it was an email I got that said it was written by Jeff Foxworthy. It really pisses me off that most liberals are NOT involved therefore they are uniformed, blind, or as you say Shane ignorant of what this country is about to become cause of the Socialist in office. I agree 100% all we can do is keep putting the info we have out there as much as we can. All of us conservatives have some of those ignorant liberal friends. Even though they may not read all of our posts. They may read some and if all of us can reach even one of our lib friends than we are making a difference.